Taken and modified from Wikipedia Commons. American Black Vultures (Coragyps atratus) are remarkable opportunists. With meathook-like beaks adapted for hooking and slicing, they have the functional morphology of obligate scavengers (Hertel 1995)†, but they'll also take eggs, plant material, garbage, and live prey (Kauffman 2001). Groups have been observed preying on skunks and opossums (McIlhenny 1939) and even juvenile sheep and cattle (Humphrey et al. 2004). The frequency of livestock depredation isn't clear‡, as Avery and Cummings (2004) note that many supposed depredation events are inferred from vultures feeding on already-dead animals; vultures will aggressively pursue afterbirth (Humphrey et al. 2004), which raises the possibility that some 'attacks' are misinterpreted. I'm not attempting to acquit Black Vultures here, but their interaction with livestock clearly requires more study. † Hertel (1995) doesn't show where C. atratus fits among the scavenger guild, but its extinct relative C. occidentalis tends to be towards the far end of variability. ‡ This doesn't stop some thousands of Black Vultures from being shot every year - along with hundreds of Turkey Vultures (Cathartes aura) which are not part of this problem (Lebbin et al. 2010). How are these daggers working by the way? I've heard the asterisks were hard to see. I'm also a bit worried when one paragraph will inevitably require three footnotes. Based on Fig. 1 from Sazima and Sazima (2010). Similar to the reported events involving livestock, ARKive has video of Black Vultures eating Capybara afterbirth and attacking juveniles, but the relationship between the species is not simple antagonism. Sazima (2007) reviewed video evidence from São Paulo which showed vultures pecking at resting Capybaras, visibly removing ticks and probable organic debris, and the giant rodents changing their posture to allow for a more thorough cleaning. The vultures were also observed to peck at sores (Sazima 2007), but it doesn't seem clear if this was a beneficial removal of necrotic tissue (as the author seemed to imply), or the vultures testing what they could get away with. As for how the association between Black Vultures and Capybaras was formed, Sazima (2007) suggested that the vultures would be familiarized with Capybaras from pecking at the sores and ectoparasites of dead or dying individuals, trying their luck with resting and healthy individuals, being denied when their behavior becomes harmful, learning to seek out resting Capybaras as a food source, Capybaras having advantageous health as a result of grooming, Capybaras adopting soliciting postures, and then cultural transmission in Capybara populations. Sazima and Sazima (2010) mentioned an interesting incident where a vulture picking off organic particles and ticks from a resting Capybara and later flew to a site 100 meters away to feed on a roadkill Capybara, supporting the proposed link between feeding on carrion and grooming (it would have been perfect if the order was reversed...). 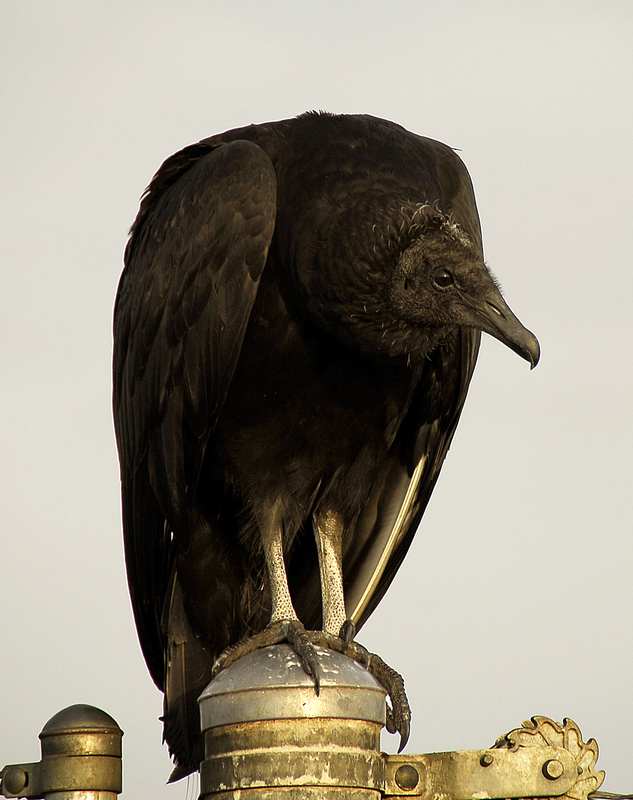 Sazima (2010) recorded a remarkable incident involving Black Vultures in São Paulo preening an Irish Setter, the only known instance of cleaner birds interacting with a terrestrial carnivore. Sazima (2010) suggested that the Black Vulture-Dog association could roughly parallel the Capybara situation - the vultures locate the dog resting, spot organic debris in the dog's fur (possibly from rolling on carcasses), approach the dog and begin to feed on organic debris in its hair, and have the dog tolerate their activity until it felt disturbed or was hurt. The dog receptive towards grooming was also recorded to playfully interact with a group of vultures (Sazima 2010), making me wonder if the dog felt preening was play as well. It is unknown if this interaction is localized and/or rare, or if it has been overlooked due to its unpredictable nature and/or lack of attention (Sazima 2010). Zamuro quitándole parásitos a un Caricare encrestado from Flickr user barloventomagico. Intraspecific allopreening has been widely observed in birds (including vultures), however interspecific allopreening is a rarity, and has mostly been observed in cowbirds (Palmeira 2008 - citing various). Palmeira (2008) observed Black Vulture/Southern Caracara (Caracara plancus) grooming/preening in Mato Grosso do Sul, Brazil; the Caracara solicited with a head-down display, and subsequently the birds began to simultaneously groom one another. Similar events have been reported from Minas Gerais, Brazil (Souto et al. 2009) and Texas (Ng and Jasperson 1984). The above photo appears to show similar behavior in Venezuela. It would then seem probable that this behavior occurs wherever Black Vultures co-exists with Caracara plancus and C. cheriway, which would be everything from Tierra del Fuego to the southern US. So why does this behavior occur? Ng and Jasperson (1984) suggest a parallel with cowbirds, which also use a head-down display, in that it could allow Caracaras to join a Black Vulture flock for feeding and roosting. Souto et al. (2009) further suggest that mixed flocks could have the benefits of increased surveillance, the ability of Caracaras to vocalize alarm calls would benefit Black Vultures, and the ability of Black Vultures to locate carrion would benefit Caracaras. I'm curious as to why Caracaras demonstrate this apparent social association-building behavior with Black Vultures and not Turkey Vultures, as the latter has also been observed to intraspecifically allopreen (Souto et al. 2009 - citing Harrison 1965) and is apparently better at finding carcasses (probably by olfaction), even buried ones (Smith et al. 2002). It's worth noting that Sazima (2007) suggested that the long and slender bill of Black Vultures, capable of tearing flesh from small carcasses and catching live insects, makes them excellent pickers and thus potential cleaners. I suspect, for whatever reason, Black Vultures have a propensity towards grooming and aren't particularly fussy about their clientele. As for why Black Vultures don't go around grooming everything - say (to tie up loose ends) livestock - maybe only a few population in Brazil have learned that preening large mammals results in food. Alternately, Black Vultures could be preening everything that doesn't put up much of a fuss, but such incidents have yet to be recorded in the proper literature. Avery, M. L. and Cummings, J. L. (2004). Livestock Depredations by Black Vultures and Golden Eagles. Sheep & Goat Research Journal 19, 58-63. Available. Fisher, H. I. (1944). The Skulls of the Cathartid Vultures. The Condor 46(6), 272-296. Available. Hertel, F. (1995). Ecomorphological indicators of feeding behavior in recent and fossil raptors. The Auk 112(4), 890-903. Available. Humphrey, J. S., Tillman, E. A., and Avery, M. L. (2004). Vulture-Cattle Interactions at a Central Florida Ranch. Proceedings - Vertebrate Pest Conference 21, 122-125. Available. Kauffman, K. (2001). Lives of North American Birds. Houghton Mifflin Harcourt. Lebbin, D. J., Parr, M. J., Fenwick, G. H. (2010). The American Bird Conservancy Guide to Bird Conservation. University of Chicago Press. McIlhenny, E. A. (1939). Feeding habits of black vultures. Auk 56, 472–474. Ng, D., and Jasperson, B. D. (1984). Interspecific Allopreening Between Crested Caracara and Black Vulture. The Condor 86, 214-215. Available. Palmeira, F. B. L. (2008). Allopreening behavior between Black Vulture (Coragyps atratus) and Southern Caracara (Caracara plancus) in the Brazilian Pantanal. Revista Brasileira de Ornitologia 16(2), 172-174. Available. Sazima, I., and Sazima, C. (2010). Cleaner birds: an overview for the Neotropics. Biota Neotropica 10(4), 183-194. Available. Sazima, I. (2010). Black Vultures (Coragyps atratus) pick organic debris from the hair of a domestic dog in southeastern Brazil. Revista Brasileira de Ornitologia 18(1), 45-48. Available. Sazima, I. (2007). Unexpected cleaners: Black Vultures (Coragyps atratus) remove debris, ticks, and peck at sores of capybaras (Hydrochoerus hydrochaeris), with an overview of tick-removing birds in Brazil. Revista Brasileira de Ornitologia 15(3), 417-42. Available. Smith, H. R., DeGraff, R. M., and Miller, R. S. (2002). Exhumation of Food by Turkey Vultures. Journal of Raptor Research 36(2), 144-145. Available. Souto, H. N., Franchin, A. G., and Júnior, O. M. (2009). 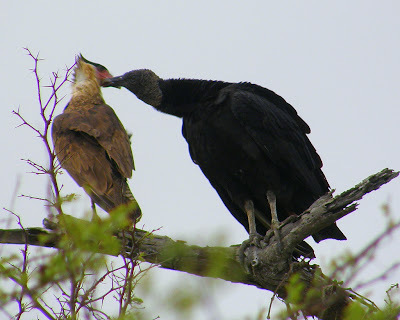 New Records of Allopreening Between Black Vultures (Coragyps atratus) (Ciconiiformes: Cathartididae) and Crested Caracara (Caracara plancus) (Falconiformes: Falconidae). Sociobiology 53(1), 125-129. Available. That's some really cool behavior. Thanks for sharing. It's really interesting to know the behavior of that bird. American black vultures are unique from other birds. Their beaks are very different and their lifestyle is not common to other birds. Travels with Gray Fox, Part 2. - Here's Part 2 of the gray fox footage. I hope it gives you some chuckles.